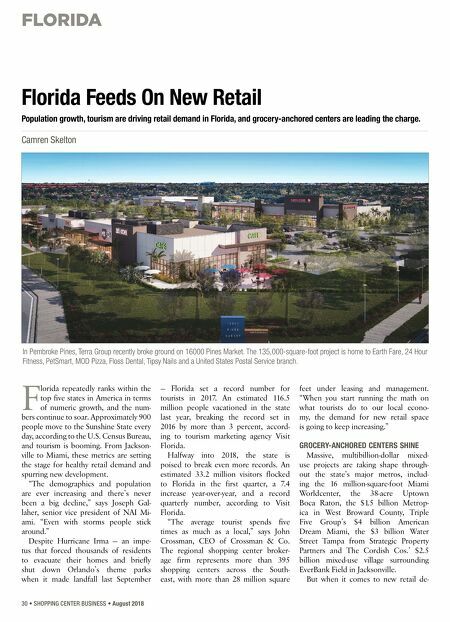 FLORIDA 30 • SHOPPING CENTER BUSINESS • August 2018 F lorida repeatedly ranks within the top five states in America in terms of numeric growth, and the num- bers continue to soar. Approximately 900 people move to the Sunshine State every day, according to the U.S. Census Bureau, and tourism is booming. From Jackson- ville to Miami, these metrics are setting the stage for healthy retail demand and spurring new development. "The demographics and population are ever increasing and there's never been a big decline," says Joseph Gal- laher, senior vice president of NAI Mi- ami. "Even with storms people stick around." Despite Hurricane Irma — an impe- tus that forced thousands of residents to evacuate their homes and briefly shut down Orlando's theme parks when it made landfall last September — Florida set a record number for tourists in 2017. An estimated 116.5 million people vacationed in the state last year, breaking the record set in 2016 by more than 3 percent, accord- ing to tourism marketing agency Visit Florida. Halfway into 2018, the state is poised to break even more records. An estimated 33.2 million visitors flocked to Florida in the first quarter, a 7.4 increase year-over-year, and a record quarterly number, according to Visit Florida. "The average tourist spends five times as much as a local," says John Crossman, CEO of Crossman & Co. 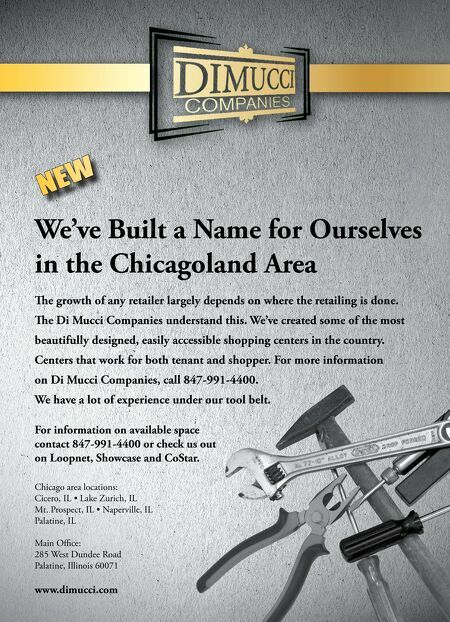 The regional shopping center broker- age firm represents more than 395 shopping centers across the South- east, with more than 28 million square feet under leasing and management. "When you start running the math on what tourists do to our local econo- my, the demand for new retail space is going to keep increasing." GROCERY-ANCHORED CENTERS SHINE Massive, multibillion-dollar mixed- use projects are taking shape through- out the state's major metros, includ- ing the 16 million-square-foot Miami Worldcenter, the 38-acre Uptown Boca Raton, the $1.5 billion Metrop- ica in West Broward County, Triple Five Group's $4 billion American Dream Miami, the $3 billion Water Street Tampa from Strategic Property Partners and The Cordish Cos.' $2.5 billion mixed-use village surrounding EverBank Field in Jacksonville. But when it comes to new retail de- Florida Feeds On New Retail Population growth, tourism are driving retail demand in Florida, and grocery-anchored centers are leading the charge. Camren Skelton In Pembroke Pines, Terra Group recently broke ground on 16000 Pines Market. The 135,000-square-foot project is home to Earth Fare, 24 Hour Fitness, PetSmart, MOD Pizza, Floss Dental, Tipsy Nails and a United States Postal Service branch.